More to Explore: We've Only Just Begun! On the Cover: In the realm of space exploration, we citizens of Earth have made an astonishing amount of progress in the last 35 years. Our visit to Pluto and Charon is a testament to the power of vision and focused, hard work in reaching ambitious goals. Our cover image is a colorized, infrared layer from the now famous, enhanced-color, high-resolution global view of Pluto captured by New Horizons on July 14, 2015. To read more about how the image was created, go to planet.ly/colorpluto. 6 The Extraordinary Pace of Progress: Jennifer Vaughn and Bruce Betts celebrate advances in space exploration over the last 35 years. 14 From the Archives: Donna Stevens shares a few photographs of our founders from the Society's early days. 18 Humans Orbiting Mars Casey Dreier looks at a realistic plan. 20 Drilling and Imaging Updates: Bruce Betts updates us on the Planetary Deep Drill and Mastcam-Z. 2 Snapshots from Space The landscape of a comet. 4 Your Place in Space Bill Nye celebrates our past and looks toward our future. 13 Q&A Space telescopes vs. planetary probes. 13 Volunteer Spotlight Kate Howells talks about the power of a cool view. 16 Members' Dialogue Reader responses to the Society's Humans On Mars paper. 19 Factinos New evidence for water on Mars. 21 What's Up? Pre-dawn planets and Geminid meteor shower. 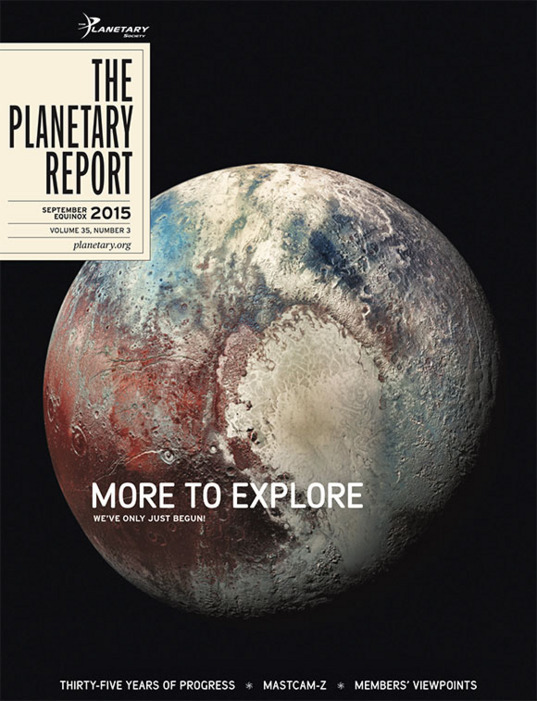 23 Happening on Planetary Radio Mat Kaplan talks to the scientists and engineers that make exploration happen.